The tibial plateau is the upper surface of the tibia or shin bone. It is prone to becoming fractured in high-speed accidents such as those associated with skiing, horse riding, and certain water sports. There is normally a recent history of trauma to the knee area followed by swelling and pain in the joint. The patient may complain of the stiffness of the knee and be unable to weight bear on the injured leg. What is a tibial plateau fracture? Fractures of the tibial plateau are considered quite serious as this upper surface of the bone contains structures which are critical to the knees functioning. Hence, fractures of the tibial plateau are often associated with injuries to the anterior cruciate ligament, collateral ligaments (MCL or LCL), menisci and articular cartilage. This damage, although repairable, highly disposes the knee joint to the early onset of osteoarthritis, particularly in younger patients. Rest and apply cold therapy or ice and compression to help reduce pain and swelling. Seek medical assistance immediately. In order to correctly diagnose a fracture, an X-ray must be performed. If soft tissue (ligaments, cartilage etc) damage is suspected an MRI scan may also be advised. Once the tibial plateau fracture has been diagnosed a number of treatment options are available depending on the extent of the damage. In surgical terms, there are 6 different classifications of tibial plateau fractures, depending on the severity and the nature of the injury. However, broadly speaking fractures of the tibial plateau can be separated into two main groupings: Displaced and Non-displaced fractures. 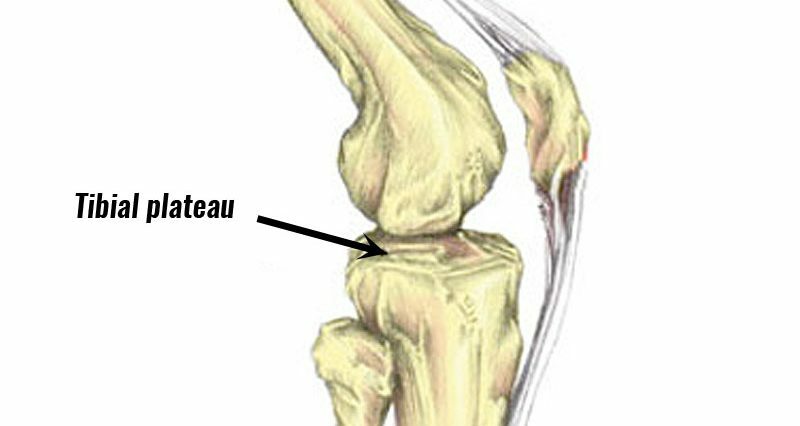 A non-displaced fracture of the tibial plateau is when the tibia sustains a break or crack without a fragment of the bone becoming separated. These fractures normally have a better future outcome than displaced fractures and usually, heal without surgical intervention within 3-4 months. Within this time the patient may be required not to weight bear and to wear a knee brace on the injured knee. Physical therapy rehabilitation exercises are needed to maintain leg strength soon after injury and should be continued throughout the recovery phase. A displaced fracture is one where the bone breaks into two or more fragments. In this case, surgery is normally needed to re-fix the fragments in place to encourage correct healing of the bone tissue. This fixation is usually achieved by placing screws and/or plates in and around the bone fragments to keep them secure. Recovery following surgery may take a number of months and will require the patient not to weight bear for a long period of time. If soft tissue injuries have been sustained this recovery process may take longer.